In industrial and heavy-duty environments, tools and equipment are frequently needed in multiple locations. It wastes time to stop work to search for or store materials, and this often leads to a messy, disorganized storage area that also takes up space. 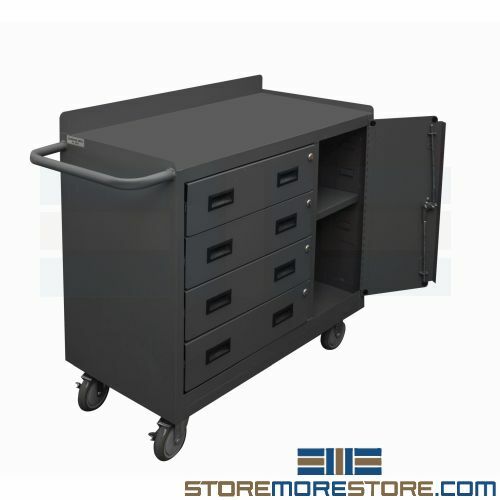 Instead of static storage, mobile workbench carts and drawer cabinets can help by providing fast and easy transportability, keeping what you need where you need it. Additionally, the workbenches provide both storage and a surface to work on so you can use your space more effectively. With its heavy-duty steel construction, the mobile workbench carts are designed to withstand even the toughest environments. You can choose from a variety of cart types with accessories such as shelves, doors, varying work surfaces, and drawers. Work surface finishes include maple, steel, tempered hardboard, or black rubber mat. Browse our online store to see what models and configurations we have available. 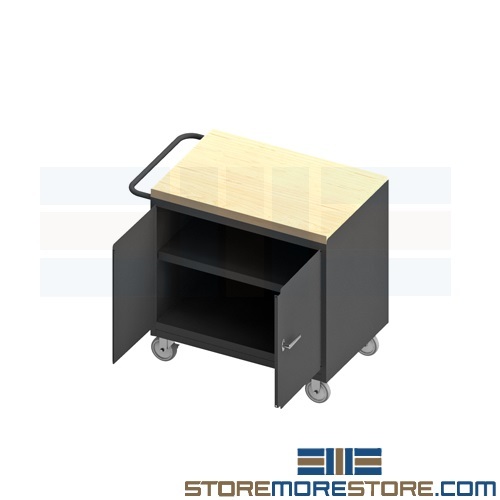 Mobile workbench carts are available to buy online and ship in 5-10 business days with free dock-to-dock shipping. If you need any assistance or just want some help picking the right solution for you, please call us at 1-855-786-7667.